Amanda called me in the evening on Sunday Jan. 28th to tell me that her water had broken and thus labor was on its way. Within a few hours she began to have contractions. She labored at home throughout the night into the wee hours of the morning on the 29th. Around 3am we all headed to the birthing center. 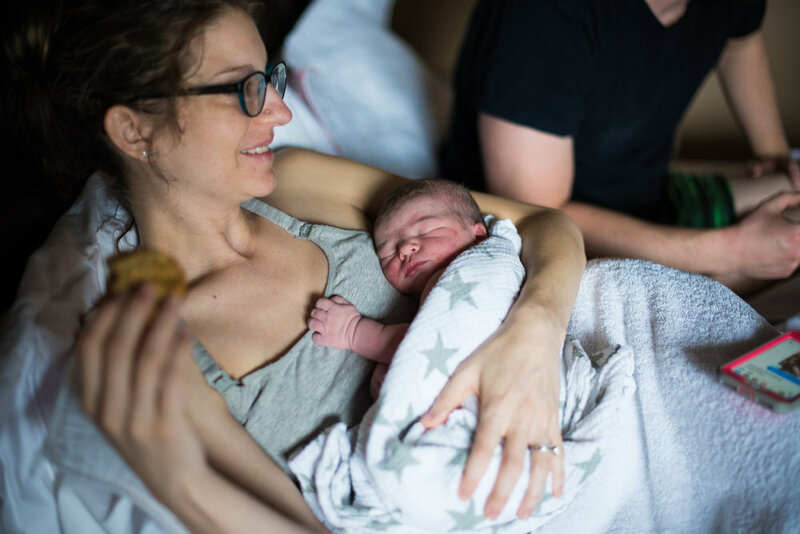 This time around Amanda decided she wanted an unmedicated birth out of the hospital, choosing to birth at Authentic Birth Center in Wauwatosa. When I arrived Amanda was in the zone working through each wave as it came. Her husband, Brian, was being an amazing birth partner squeezing her hips through each contraction. Soon after getting Authentic, Amanda was ready to get into the tub to help her relax as the waves of labor grew more intense. Her husband was at her side throughout the entire birthing journey rubbing her back, squeezing her hips, and holding her close. Baby Porter was born at 7:15am and placed on his mama’s chest. They waited to find out the gender of their little one so it was quite an exciting moment when they found out they had a son! Porter is Brian and Amanda’s second born and little brother to their daughter Ella. Amanda and Brian, you make an amazing team! It truly was an honor to capture your beautiful birthing journey. You have so much love in your hearts and are spreading that love with your little ones! I pray the love in your family continues to grow and to be contagious to all you come into contact with!